With the school summer holidays fast approaching, it is the best time to ensure that you are fully prepared for the school year ahead. As education professionals, We understand that keeping up with the curriculum can prove challenging, however it is important that you are as prepared as possible for the year ahead in order to minimise unwanted challenges caused by malfunctioning or limited equipment. To this effect, we have provided a comprehensive list of the best weighing scales we have to offer for every tier of education. Plan for the year ahead and view our selection of weighing scales and balances for educational use. Why do I need a scale for educational use? Scales are essential pieces of equipment ideal for any science weighing experiment. Scales are necessary for weighing compounds, chemicals and other materials to ensure that you have the correct measurements when conducting classroom experiments. Younger students may also use weighing scales and equipment for weighing small animals and insects in biology or testing gravity in physics. In schools, science technicians are required to prepare materials, samples and equipment for practical laboratory experiments. To ensure that there are ample materials for all students, samples will neded to be standardised and accurately weighed. By using a weighing scale, you can be confident that you are fully prepared for each lesson and have the correct amount of each sample per student or group; this can also save you money when buying expensive lab materials for experiments. More advanced balances have built-in weighing functions such as density determination that can calculate values without the need for laborious recording procedures. Moreover, balances can weigh in incredibly small increments which are necessary when conducting chemistry experiments with hazardous chemicals and other materials. Compact scales are small, affordable, easy-to-use scales for entry-level weighing. Due to their small size, compact scales are usually portable with many ranges relying on rechargeable batteries rather than power mains. These scales tend to be robust in design and can withstand rigorous use, making them ideal for teaching younger students about mass measurement. Precision scales are highly-versatile weighing machines that typically have greater weighing resolutions and weighing applications than standard compact scale models. These scales can carry out a range of weighing experiments and are frequently used for weighing chemicals, powders and other materials in chemistry, biology and physics lessons. Balances designed for education tend to have a compact design to allow stacking and easy transportation. Portable models are ideal for conducting field experiments. Analytical balances are high-level weighing machines that tend to be more expensive than other types of weighing scales. These balances are feature rich and can be used for more complex weighing experiments, with some models including in-built density determination calculation software. These balances are used to weigh in tiny increments (up to 0.1mg) and are commonly used by university students, chemists, science technicians and laboratory professionals. Before conducting your search, you will need to identify your budget. There are many types of scales and balances on the market, and they can prove expensive, especially when supplying equipment for a whole class. Scales and balances can offer a vast array of features including portability, resolution, internal calibration and shock protect features to name a few. Therefore we recommend reading product feature lists carefully in order to determine whether a scale is appropriate for your requirements. More advanced weighing scales and balances come with a series of weighing modes and applications for fulfilling more complex weighing tasks. For example, if you are looking to count screws you will need to ensure that you have a scale with parts counting applications, in contrast, if you are looking to measure density, you will need a balance with built-in density determination for best results. It is vital when buying a scale that you have checked the overall weight capacity. It’s no use having a digital scale with a max capacity of 6kg if you are looking to regularly weigh heavy chemicals over 10kg, attempting to use a scale that is not built to handle the specified capacity will result in damage to the internal mechanism of the scale. Robust, simple weighing scale ideal for use in classroom environments. Adam Equipment's Dune compact scales are affordable, simple to use scales constructed from durable, splash-proof ABS plastic housing. These scales are fully portable and can be stacked and stored in science prep rooms or store cupboards. Small, entry-level weighing scale. 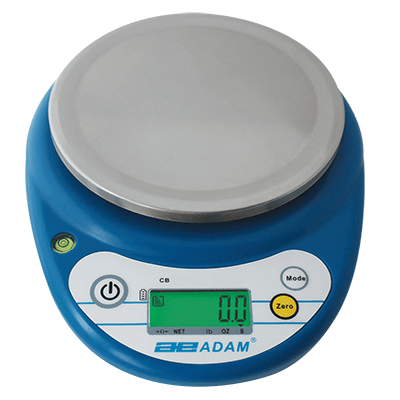 Adam’s CB is a cheap compact scale that is perfect for use in KS1 and KS2 classroom environments. Due to its small size, this scale can be easily stacked and stored in classroom cupboards. The TBB triple beam balance is a low-cost mechanical weighing scale for basic weighing applications. This low-cost balance is ideal for teaching students mass measurement concepts in classroom environments. This model can be purchase with a custom carry case for easy transport. Kern’s EMS school balance is specifically designed for use in school classrooms, colleges and chemistry labs. The scale is constructed with a compact, flat design and large shockproof plastic weighing pan for protecting against accidental knocks. The EMS is fully portable can be stacked and stored away with ease. Sturdy, durable portable scale for multi-purpose weighing. The Core comes with a unique stackability feature that allows multiple Core scales to stack on top of each other for easy transportation. These scales also come with Adam’s patented ShockProtect feature used to withstand excessive overload without damaging the weighing mechanism. A&D’s EJ is a great value, highly practical scale built to handle almost any basic-intermediate level weighing task. The EJ provides a variety of weighing applications including checkweighing, parts counting and percentage weighing. Perfect for field experiments, these scale are easy to transport and store. Eclipse precision balances feature a smart, top-quality design and come in a wide range of models and platform sizes, allowing you to choose the model best suited to your environment. Eclipse balances include high-levels of precision (up to 1mg) and offer 6 different weighing modes, including percentage weighing, density determination and checkweighing. The Eclipse is a great value choice for university level weighing. One of Adam Equipment’s most popular balances. The Nimbus analytical balance range is an advanced-level weighing machine that is used to weigh in tiny increments (up to 0.1mg), perfect for use in university laboratories. Built-in applications include parts counting, percentage weighing, dynamic/ animal weighing and density determination. A full range of weighing experiments can be conducted with this balance. Versatile, highly-reliable balance for high-precision weighing. Highland balances come with a vast array of features including Adam’s patented ShockProtect feature for withstanding excessive overload and Handical feature for auto-internal calibration. These balances are ideal for field experiments and come complete with multiple weighing applications including parts counting, percentage weighing and accumulation. The most advanced balance offered by Adam Equipment. The ABL is a professional semi-micro balance with up to 0.01mg resolution for weighing powders and chemicals in tiny increments. The ABL offers 8 different weighing modes including display hold, dynamic weighing, density determination and formulation. The ultimate choice for university students, chemists and laboratory professionals. Update: Please note that this offer expired on the 31st August 2018, however please contact us to find out more about our current scale and balance offers! If you are a school or educational institution looking to kit out your classroom, we are now offering bulk buy weighing scale deals. To take advantage of these deals, please enter the relevant discount code at the checkout. When you buy 6 or more CB compact scales (any model). When you buy 6 or more Dune DCT 2001 models. When you buy 6 or more Highland HCB 602H models. When you buy 1 or more Nimbus precision balance NBL 223e and 423e models. When you buy 1 or more Nimbus analytical balance NBL 254e models. If you require more information, please contact us directly at inscale@sales.co.uk.